After working with SAiGE Decking for over a year they decide that they wanted to take their business to the next level. After a meeting to discuss we decided that the best way to do it is with a new website on a premium exact match domain. 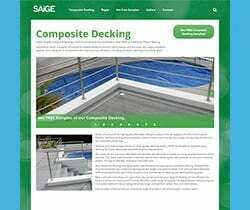 I negotiated the purchase of www.compositedecking.co.uk on behalf of SAiGE and built this new exciting website from the ground up but using elements of the old website augments with new images / copy & functionality. 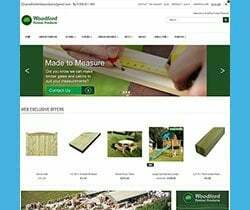 This site is built on WordPress and its primary function is to gather enquiries and sample request from UK and Irish potential composite decking customers. As well as being a showcase for this fantastic material in order to attract new distributors / fitters and other large volume purchasers. evince are specialists in delivering high quality and highly search engine optimised websites. For more examples of websites like this see the evince web design & web development portfolio or contact us for more information via the contact form or call +44 (0) 1483 361 151.